Dynamite Goat is my favorite. If you’ve ever ridden Big Thunder Mountain Railroad at Disneyland you’ve probably seen Dynamite Goat. He’s a goat, standing on top of a mountain, with a stick of dynamite in his mouth. He is a goat who knows how to party. Of all the many wonderful details found on Big Thunder, this goat is the most overtly comical, and one of the most memorable. Little flourishes and world-building notes like this are what make the best Disney attractions the best theme park rides you’ll ever experience. I’m staring at Dynamite Goat right now, even though I’m not riding Big Thunder. I’m not even technically in Disneyland proper. I’m in the lobby of the Frontier Tower at the Disneyland Hotel, looking at a 1/20th scale model based on the Disney Imagineers’ original 1970s plaster mock-up of the Frontierland roller coaster. Near the top of the model, standing next to a miniature shack full of miniature fake dynamite, stands that goat, a single stick lodged in his tiny toy mouth. You can find fascinating little displays like this model in all three of the Disneyland Hotel’s towers, if you’re into Disneyland’s history as much as you are the park itself. In addition to that miniature Big Thunder, you can find models of Jungle Cruise gags in Adventure Tower and Mary Blair artwork from it’s a small world in the Fantasy Tower. Fantasy’s lobby, the main lobby for the whole hotel, is full of photos of various celebrities and dignitaries visiting the park over the decades, from presidents to Dolly Parton, some accompanied by Walt Disney himself. Disney knows how to capitalize on its own history, uniting decades of nostalgia across multiple generations into an experience as powerful as any of the attractions in its theme parks, and the public spaces at the Disneyland Hotel were clearly designed with that in mind. It’s ironic, then, that none of the original Disneyland Hotel from 1955 still stands. The original two-story buildings from that year were demolished at the end of the ‘90s to make room for the Downtown Disney shopping and dining area. The towers that exist today were opened between 1962 and 1978, and weren’t even known by their current names until earlier this decade. 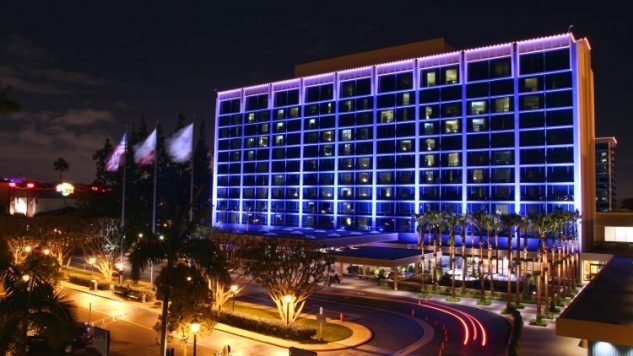 Like Disneyland itself, the Disneyland Hotel has changed dramatically throughout the years, but through its historic footprint and a dedicated attempt to tie the current hotel into the park’s past, it’s never lost hold of that nostalgic power. My recent visit was my first time staying at the hotel, and I had no idea how much it had changed in just the past decade until I started researching this piece earlier today. I don’t know what the Disneyland Hotel was like when it opened, or in my childhood, or even 10 years ago. I know what it’s like today, though, after a short trip earlier this month. Disneyland Hotel is a modern luxury hotel with a design sense that’s unmistakably Disney without being garish or overbearing about it. It’s not themed in the way so many other Disney hotels are, content simply to evoke the feel and history of Disneyland instead of trying to immerse you in an extravagantly detailed environment. With Disneyland just a short walk (or Monorail ride) away, and a handful of perks that aren’t available to guests staying in other Anaheim hotels, it’s a great place to stay during a Disneyland visit—if you can afford it. I stayed in one of the standard rooms, with a standard view, and I was impressed both by how luxurious it was and by how it never let me forget I was at Disneyland without being too obvious about it. It’s a comfortable, inviting space, with a bed so soft and warm that I had a hard time waking up even though I was excited about going to Disneyland. The soft, thick carpet felt great on my bare feet after a day of schlepping around the theme parks, and the blue and gold pattern hinted at a storybook aesthetic while also being covered with Mickey ears. There was a framed photo of Walt Disney walking in front of the park’s castle on the wall, but most Disney-specific design elements were either muted or not always apparent. I didn’t notice that the lights in the bathroom look like they’re being held by the four-fingered gloves of Mickey Mouse until the morning I checked out. The large headboard running behind the two queen beds in the room was decorated with a tasteful wood carving of Sleeping Beauty’s castle. There was enough Disney in the room to please the most passionate Disney fans, but it was just minimalist enough to not seem chintzy. The one major design element that could be considered over-the-top was so beautiful and surprising that even the biggest grump would probably be enchanted by it. That wood carving on the headboard is much more than it first seemed. At the end of my first night there I flipped the two switches on the lamp next to my bed. Suddenly a music box version of “When You Wish Upon a Star” started playing in my room and the castle on the headboard started to shine. Lines of small bulbs curlicued out like the fireworks that are shot off at Disneyland every night. It was the largest and loudest nightlight I’d ever seen, but also the most charming. The tune only lasted for a few notes, and the lights weren’t bright enough to keep me or my guest up, so we left it on as we slept. You might think a wall-length nightlight that plays music is a little extra, and it absolutely is, but in the best way possible. 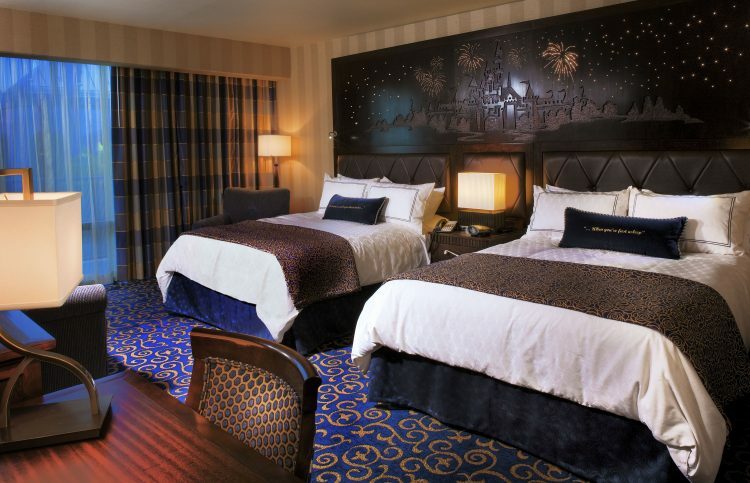 In addition to the standard rooms, the Disneyland Hotel has a few themed rooms based on specific Disneyland attractions. I wasn’t able to see any of those in person, but if you’re looking for a more immersive experience, and can afford the higher rates, you might be interested in rooms like the Pirates of the Caribbean Suite or the Mickey Mouse Penthouse. There are five of them in total, including rooms based on Adventureland, Fantasyland and Big Thunder. When I wasn’t in the room or at one of the theme parks, I spent most of my time at the hotel enjoying its collection of pools and hot tubs. 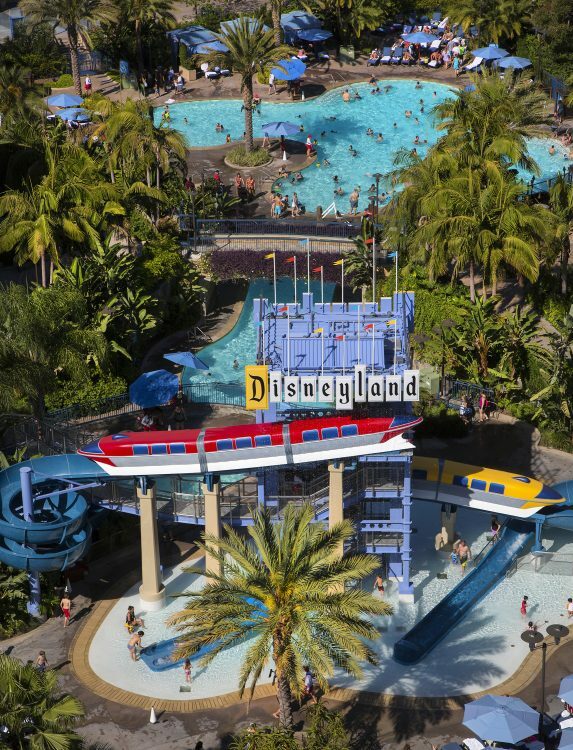 This complex continues the hotel’s understated embrace of Disney history, naming its two pools after the old ticket books that Disneyland guests had to buy to get on rides, and using its two waterslides to pay tribute both to the original monorails and the classic Disneyland sign. A surprise thunderstorm closed the pools before I could hit those waterslides, but I was still able to spend hours in both the hot tubs and the pools. I didn’t rent any of the cabanas nearby, but I gladly made use of the wait staff circling about taking drink orders from the Trader Sam’s menu. Between the E-Ticket and D-Ticket pools, the hotel has both a family-friendly hang-out pool and a place for serious swimmers to get their laps in, and the tiles for both are decorated with recreations of the tickets they’re named after. The hot tubs are simply hot tubs, but they fit a lot of people, and it’s not like there’s anything wrong with just being a hot tub, anyway. If you or your family needs a great pool during your theme park trip, it’s hard to do better than the pools at the Disneyland Hotel. Those pools are nice, but they aren’t the best thing about the hotel’s recreation area. That would be Trader Sam’s, a bar that sits just feet away from the pools. Trader Sam’s has quickly become legendary among Disney fans, and it’s no surprise why: it’s an amazingly themed tiki bar full of subtle Disney references, drink-specific special effects, and a great drink menu. And, when I was there earlier this month, Trader Sam’s also featured a cameo from Nicolas Cage, who was slurping down an Uh Oa in the corner while dressed like Panama Jack. Okay, you can’t really expect to see Nic Cage himself every time you go to Trader Sam’s. What you can expect is one of the coolest bars you’ve ever been to, and some of the finest design work that Disney’s Imagineers have done this century. Trader Sam’s transports you to an idealized tiki bar, full of Polynesian-themed design flourishes and Easter eggs from the Jungle Cruise ride at Adventureland. Pictures of dormant volcanos and tranquil beachfront scenes on the walls come alive when specific drinks are ordered, with blue backgrounds suddenly turning red and lava spewing out of the volcano. Hawaiian steel guitar music and other midcentury exotica completes the feeling of drinking like your grandparents (or great-grandparents) did back after the war. It’s a gorgeous room and perhaps the most relaxing place at all of Disneyland, and it’s right there at the Disneyland Hotel. Just be careful about which stool you take if you sit at the bar—you might be in for a surprise. Trader Sam’s also has a small menu of appetizers. If you want a full meal you can hit up Tangaroa Terrace, which shares the same building as Sam’s and has a menu full of Polynesian-influenced pub food, but is currently closed for refurbishment. The hotel’s other food options include Goofy’s Kitchen, which offers buffet-style family dining alongside your favorite Disney characters. Like most character dining locations at Disney parks, it’s both on the high side, price-wise, and also aimed squarely at families with young children. 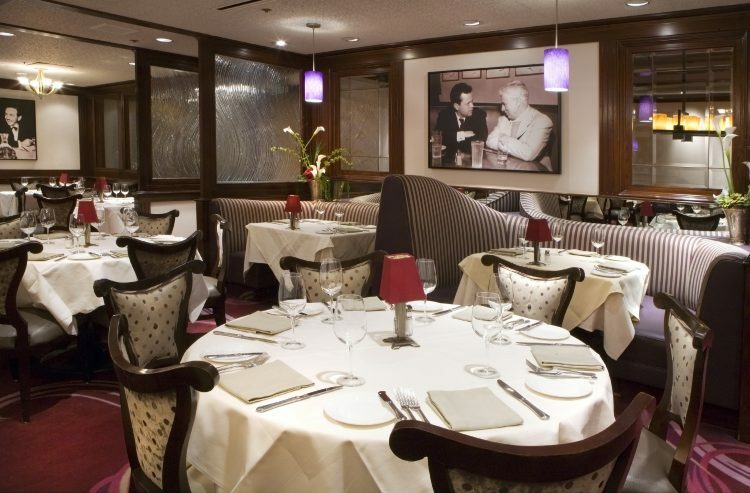 The other restaurant at the hotel is Steakhouse 55; it’s not named that because the steaks cost $55 (1955 is the year Disneyland opened), but, uh, the steaks still do cost about $55, on average. Think a fancy steakhouse, where choice cuts of steak will set you back between $45 and $58, and where sides have to be ordered separately. It’s definitely a classy way to treat yourself. The hotel is also right next to Downtown Disney, which has several other restaurants at various price points, so there are more options than just what you can find in the hotel itself. I’ve stayed at a few different hotels in Anaheim, and at multiple Disney resort hotels at Disney World, and between its wonderful rooms, the great pool area, and the majesty of Trader Sam’s, the Disneyland Hotel is almost unbeatable. I’d give the Animal Kingdom Lodge at Disney World a slight edge, mostly because of the live animals that roam the savannah and the immaculate theming throughout that hotel. I haven’t stayed at either of the other Disney hotels in Anaheim, but strictly in terms of comfort and services Disneyland Hotel outranks the nearby non-resort hotels I’ve stayed at. As great as the hotel is, I’m not sure if I’ll pay two to three times what other hotels in the area charge next time I visit Disneyland, but it’s definitely worth the occasional splurge. And if money is no object to you, you’d be hard pressed to find a better place to stay. Because, at the end of the day, the Disneyland Hotel is quintessentially, inescapably Disney, with a taste and elegance that evokes the classic charm of Disneyland. Also read our review of Disney World’s Yacht Club Resort.